Flagstone is one of the most popular pool deck materials. Flagstone is organic looking, long-lasting, and has a rough texture providing for a nonslip surface . Flagstone pool decks also have a very natural and organic look due to their natural shapes and shades. Pavers Driveways VA located in Northern VA, Fairfax County, Reston, Great Falls offers various styles and sizes of flagstone ranging from square cut for formal pool decks, to irregular shaped for informal pool decks. Our most popular flagstone types are Pennsylvania Flagstone, Vermont slate, travertine, bluestone, limestone, slate, quartz, Tennessee limestone, and sandstone. Flagstones can be dry laid on a sad bed or set in mortar on a concrete base. Pavers Driveways VA has been building quality pool decks for over the past 25 years in Herndon, Reston, McLean, and Falls Church. We offer various pool deck options including flagstone pool decks, brick pool decks, pavers pool decks, natural stone pool decks, and concrete pool decks. We select quality flagstone, brick, paver, stone, and concrete for our clients. Brick pool decks are a timeless classic. 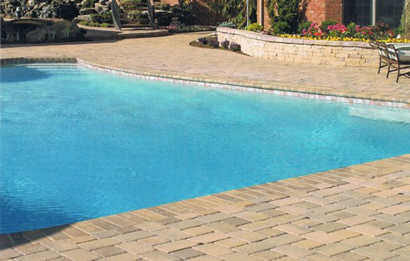 Some of the benefits of brick pool decks are color integrity, durability, and easy repairs. Bricks are very affordable, come in various color shades, and can be laid in many different patterns. Brick pool decks offer a long life and great aesthetic appeal. Pavers Driveways VA has been building quality pool decks for over the past 25 years. We offer various pool deck options including flagstone pool decks, brick pool decks, pavers pool decks, stone pool decks, and concrete pool decks.. We select quality flagstone, brick, paver, stone, and concrete for our clients. Interlocking pavers are a wonderful choice for pool decks because of the rich texture and diversity they provide. Interlocking pavers are a great way to enhance the look of your pool deck as well as increase the value of your property in Northern VA, Arlington, Chantilly, and Annandale. Interlocking pavers come in a variety of shapes, sizes, and colors. They can also be laid in various patterns. Interlocking pavers can be made of concrete, cobblestone, flagstone, brick, or stone. Pavers come in various shades and sizes including rectangular pavers and circular pavers. Pavers fit together creating a beautiful, strong, and durable pool deck surface. The joints of the interlocking pavers are filled with sand. Pavers Driveways VA uses Techo Bloc Pavers, EP Hennery Pavers, Hanover Architectural Products, and Bellguard pavers. Pavers Driveways VA has been building quality pool decks for over the past 25 years. We offer various pool deck options including flagstone pool decks, brick pool decks, pavers pool decks, stone pool decks, and concrete pool decks. We select quality flagstone, brick, paver, stone, and concrete for our clients. Constructing your pool deck out of stone allows for a wide range of design choices and color options. When using stone to build your pool deck you may choose from river rock, flagstone, cobblestone, or naturally jagged shaped stones.Pavers Driveways VA has been building quality pool decks for over the past 25 years. We offer various pool deck options including flagstone pool decks, brick pool decks, pavers pool decks, stone pool decks, and concrete pool decks in the Washington DC, Maryland, and Northern Virginia area. We select quality flagstone, brick, paver, stone, and concrete for our clients. Concrete is a great material for pool decks due to its high durability and minimal maintenance. For concrete pool decks we offer stamped concrete. Stamped concrete can create the look of a brick or stone pool deck with the durability that concrete offers. Other less utilized types of concrete styles include stenciling, exposed aggregate, rock salt finish, and colored concrete. Pavers Driveways VA has been building quality pool decks for over the past 25 years. We offer various pool deck options including but not limited to flagstone, brick, paver, stone, and concrete. 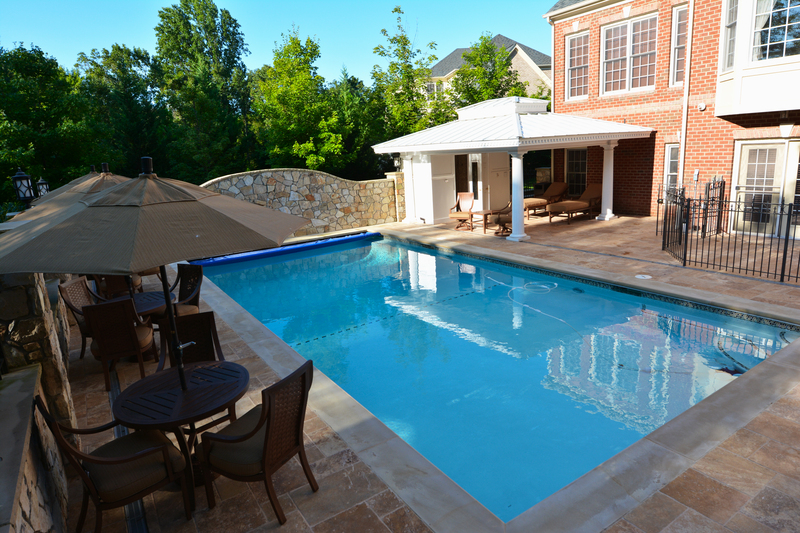 We offer various pool deck options including flagstone pool decks, brick pool decks, pavers pool decks, stone pool decks, and concrete pool decks in the Washington DC, Maryland, and Northern Virginia area. We select quality flagstone, brick, paver, stone, and concrete for our clients.